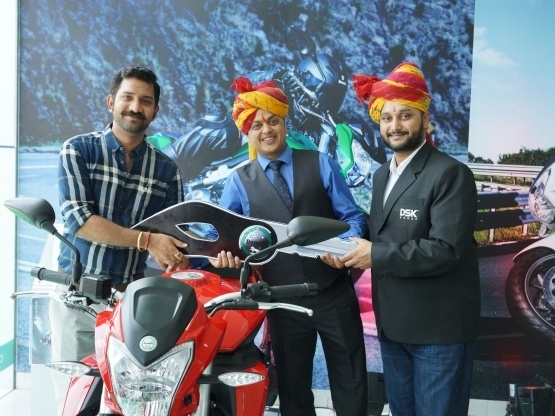 One of the Leading superbike manufacturer in India, DSK Benelli opened a showroom in Pink city- Jaipur. DSK Benelli is located at Plot No. 16 to 19, Kalyan Vihar Colony, Near Vishnu Garden, Tonk Road. It will showcase its entire product range available in domestic market, under the dealership of ‘Saga Autowheels’. The showroom houses the sporty-looking Tornado Naked Tre, or TNT superbikes that encompass the TNT 300 – In-line two-cylinder 300cc engine, TNT 600i - In-line four-cylinder 600cc engine, TNT 600 GT - In-line four-cylinder 600cc engine, TNT 899 - In-line, three-cylinder 898cc engine and TNT R - In-line, three-cylinder 1131cc engine. Born of rich, pure lineage, DSK Benelli today boasts an impressive range of globally-respected superbikes that marry heritage, innovation, styling and technological prowess. DSK Benelli’s distinctly stylish motorcycles are known for their Italian flamboyance and the ability to provide riders from all walks of life a pure, high-performance experience. DSK Motowheels is assembling and selling Benelli bikes across the country and supporting them with a good backup of service and spares. With its mounting sales and service network, the brand offers 24 x 7 on call breakdown service.